Preheat oven to 180C. Place small balls of dough on a baking sheet, and press with your thumb to flatten and make a dent in the middle of the cookie. Bake for 15 minutes. You can either fill these dents with jam before you bake (in which case it gets a bit chewy) or you can bake them plain then fill them, which is what I am going to do with the other half of the cookies up there. Or you can ditch jam and fill with whipped cream. Or ganache. One cookie, endless possibilities - that's the way I like it! These sweet little treats are my entry for Srivalli's Mithai Mela. 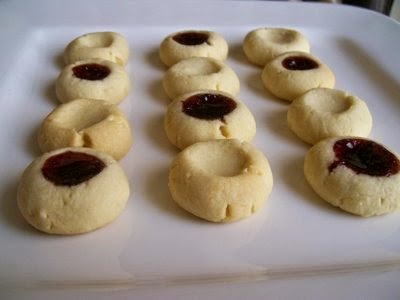 I love these cookies for the preserves. I add them before baking all for the chewiness. Hi Simran , I have read most of ur cookies recipes but hav nt tried any yet coz my experiments with baking cookies has not been gr8 yet.Most of the ur measurements are in grams , do u hav a weighing scale coz it is diffclt to hav the exct measurents in the cup for the same? Pinky - please give me your mail id and I will send you some handy conversions I use for converting grams to cups. I was scared of baking cookies too, but once I got them right it's worked perfectly for me. Lovely cookies lol....pass the rest of the batch to me gal.. Outstanding. And boy the cherry is so dramatic, it looks gorgeous. Just been crazy busy. Not to mention we've been living on sandwiches so not much to post :-) There's hope though..I took some pics today, lets see if I make them reach blogger! Thanks for checking on me. Lovely cookies :)Nice click too! i tried these cookies and they turned out good...though i took the liberty to make some changes.